I've read more crap reviews about Shorai than any other but that may be because most people on this forum have or still own a shorai over the other brands out there. Not only that they need a special charger. WPS does not. No reason to pay more for the same quality. Note, none are perfect, but the failure rate Is pretty low. You can use a normal charger just can’t have desulfation mode, I’ve had the special charger and still the shorai battery only lasted a year. Just installed shorai. 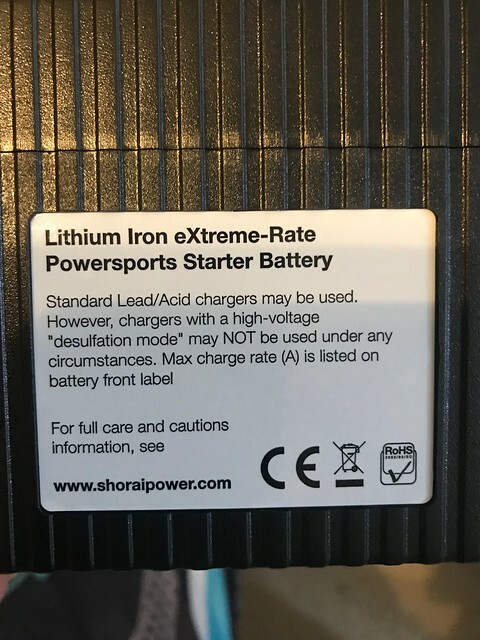 On battery it says you can use standard lead acid charger without desulfation mode. Dont know how long will last but it cranks at 12.4v as opposed to my agm extreme at 10.9v! Rated 210cca. Its much smaller in size. originally wanted a full size drop in replacement with more cca like antigravity but its discontinued. Not too bad. 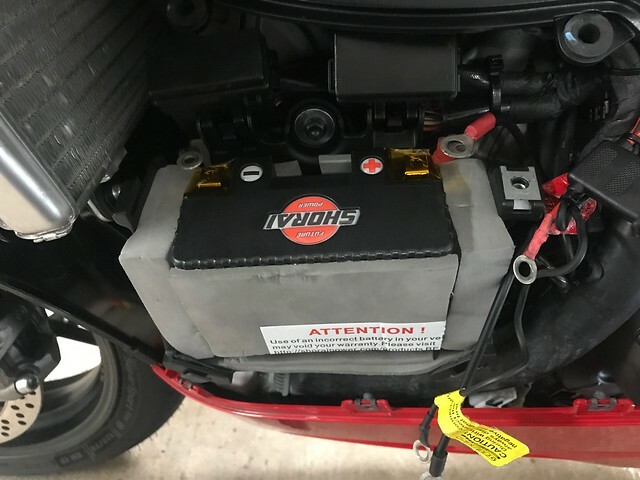 I centered the battery and slight adjustment. Don't waste your money on the pricey low weight stuff unless you have no better way to spend it. My lithium battery has been going well since start of 2014. Use a Junior Battery fighter charger only $50 on ebay. Another one in my Husaberg for 3 years and its fine. Have another in my BMW (SSB) and it is going well now for over a year. Going to put one in my old Duc too. I know its more expensive but easier than stopping and dropping turds everywhere while you are riding to keep the weight down. Yes ssb lithium batteries in all mine as well and haven't had to put a charger near any.